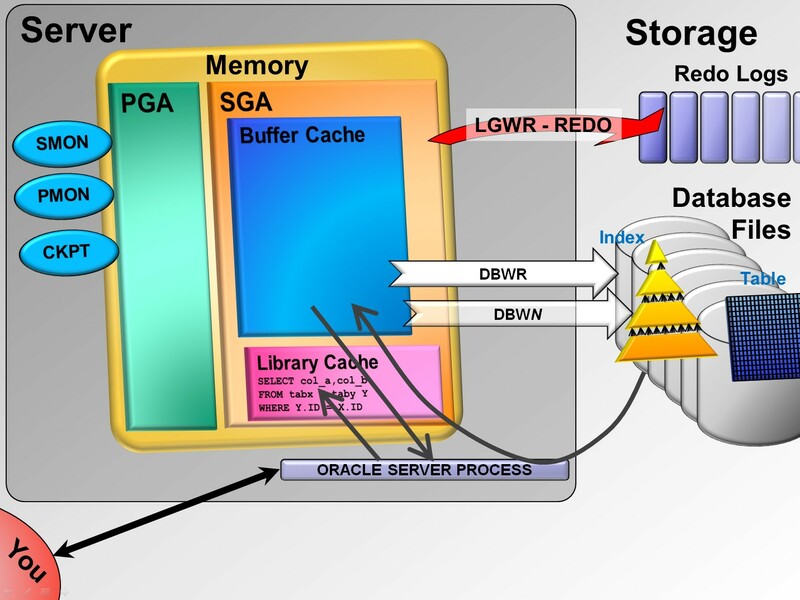 The idea behind the presentation is not to do the usual “Intro” and list what the main Oracle operating systems processes – SMON, PMON, RECO etc – are or what the various components of the shared memory do. I always found those talks a little boring and they do not really help you understand why Oracle works the way it does when you use it. I aim to explain what redo is, why it is so important, what actually happens when you commit, how data is written to and read from storage to the cache – and what is actually put in the buffer cache. I explain the concept of point-in-time view, how Oracle does it and why it is so fantastic. And a few other bits and pieces. I’m not trying to explain to people the absolute correct details of what goes on with all these activities that the database does for you. I’m attempting to give people an understanding of the principles so that more advanced topics make more sense and fit together. The talk is, of course, aimed at people who are relatively new to Oracle – students, new DBAS or developers who have never had explained to them why Oracle works the way it does. But I have found that even some very experienced DBA-types have learnt the odd little nugget of information from the talk. Of course, in an hour there is only so much detail I can go into when covering what is a pretty broad set of topics. And I lie about things. I say things that are not strictly true, that do not apply if more advanced features of Oracle are used, or that ignore a whole bucket full of exceptions. But it’s like teaching astrophysics at school. You first learn about how the Sun is at the centre of the solar system, all the planets & moons revolve around each other due to gravity and the sun is hot due to nuclear fusion. No one mentions how the earth’s orbit varies over thousands and millions of years until you have the basics. Or that GPS satellites have to take into account the theory of relativity to be as accurate as they are. Those finer details are great to learn but they do not change the fundamental principles of planets going around suns and rocks falling out of the sky – and you need to know the simpler overall “story” to slot in the more complex information. I talk about this picture. 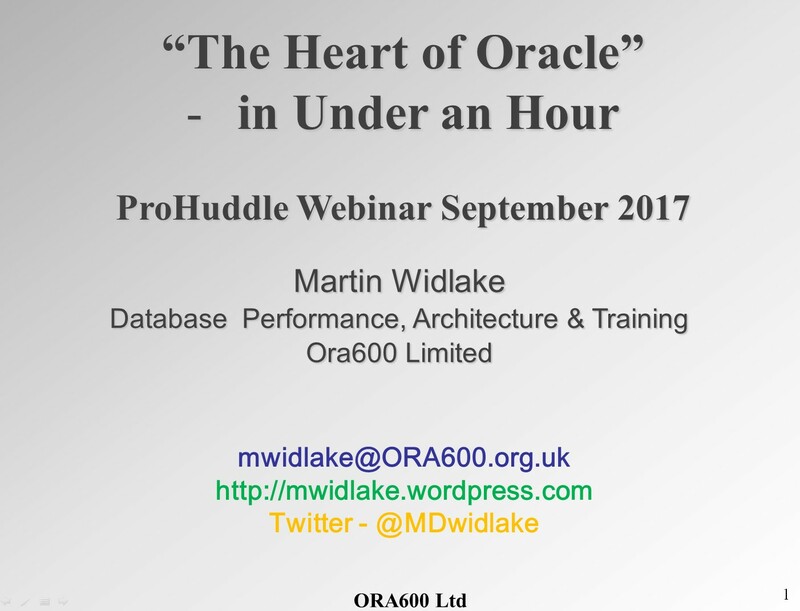 I start off the talk explaining this simplification and I do try to indicate where people will need to dig deeper if they, for example, have Exadata – but with a webinar I am sure people will join late, drop in and out and might miss that. I must remember to keep reminding people I’m ignoring details. And amongst the audience will be people who know enough to spot some of these “simplifications” and I think the occasional person might get upset. Remember I mentioned the bad feedback? I got accosted at a conference once after I had done this talk by a couple of experts, who were really angry with me that I had said something that was not accurate. But they had missed the start of the talk and my warnings of simplification and did not seem to be able to understand that I would have needed half an hour to explain the details of that on thing that they knew – but I had only 50 minutes in total for everything! As I said, this is the first Webinar I will have done. I am sure it will be strange for me to present with “no audience” and I’m sure I’ll trip up with the pointer and the slides at some point. I usually have some humour in my presentations but that might not work with no crowd feedback and a worldwide audience. We will see. But I am excited about doing it and, if it works, I may well offer to do more. As a taster, I explain the above diagram. A lot. I mostly just talk about pictures, there will be very few “wordy” slides. I invite you all to register for the talk – as I said, it is free – and please do spread the word.